[PDF] AthTek Skype Recorder is the most ever used Skype call recording software for Windows users. Many companies use AthTek Skype Recorder in their call centers for customer service recording. 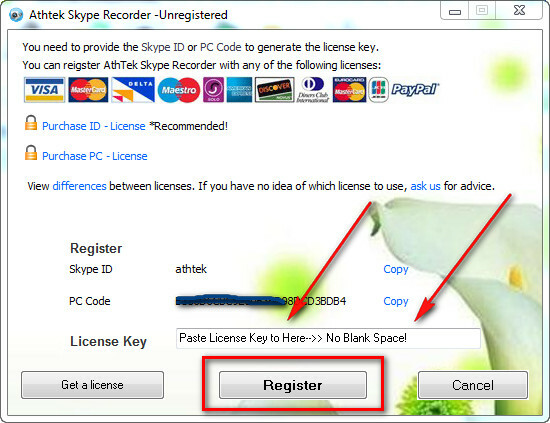 AthTek Skype Recorder can be licensed by both ID-License and PC-License (view differences). 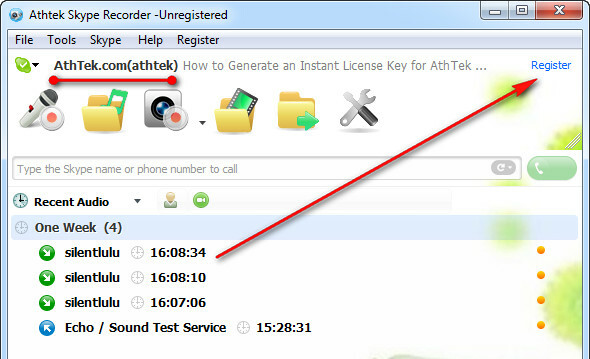 Previously, we have published a post about how to register AthTek Skype Recorder Lite for lifetime call recording. In today’s post, you will read how to register AthTek Skype Recorder pro with a lifetime license. When you have bought an ID-License or PC-License, you can input the license key to the authorization window to activate a full version. First of all, you need to install AthTek Skype Recorder to your computer. Run Skype, then you will be asked to allow the recorder’s access to Skype. Then your Skype recorder will be connected to Skype. You would be able to see your Skype name on top left of AthTek Skype Recorder. Click the [Register] link on top right corner and you will access the authorization window of AthTek Skype Recorder. In the authorization window, please input the license key to the key field and click [Register] button to license your AthTek Skype Recorder. Please note that there should be no blank space existing in the key field, otherwise you cannot register AthTek Skype Recorder successfully. 1. Where can I find the registration/authorization window? Authorization window is not a web page which you can open up in a browser. 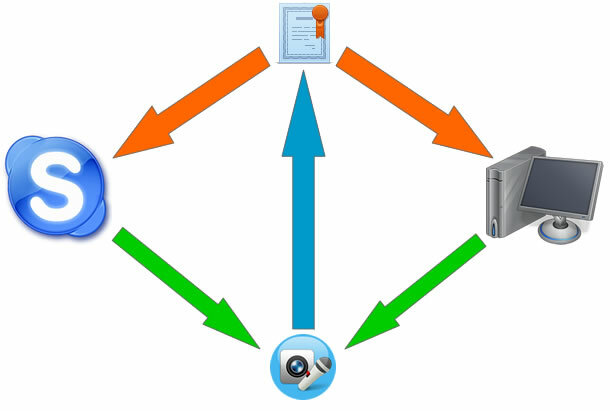 When you have got Skype connected to the recorder, you would be able to access the authorization window by clicking the [Register] link on top right corner of AthTek Skype Recorder. 2. AthTek Skype Recorder doesn’t accept my license key, why? a. Your Skype ID is exactly the same as you input when you generated the license key. b. There was no blank space existing in the key field when you clicked the Register button. If there was no problem about these items, please capture a snapshot of the authorization window and send it to support@athtek.com me for further troubleshooting. 3. I cannot get the recorder connected to Skype anyway, how? a. Completely quit both Skype and recorder on your computer. b. Go to the installation folder of Skype (default path: C:\Program Files\Skype\) and right click on Skype.exe, select [Run as administrator]. c. Right click on AthTek Skype Recorder’s icon and select [Run as administrator] to run it. Within 20 seconds, Skype should be able to find AthTek Skype Recorder. 4. I can’t find Skype.exe in my computer, why? This is mainly because you are using an integrated version Skype on the computer. Please download and install a desktop version Skype, then the problem will be solved. You can download Skype v6.8 directly here for free. If you have got the key but failed to register AthTek Skype Recorder, please read Registration Troubleshooting.